Van drivers are being left out of pocket because the UK’s roads are not fit for purpose, according to research by Mercedes-Benz. A survey of more than 2000 van owners found that potholes cause £500 worth of damage to each vehicle every year. With 4.2 million vans on the road in the UK, that puts the total estimated cost of repairs at a staggering £1.1 billion. The Local Government Association claims that councils are fixing a pothole every 21 seconds, but there is a £9.3 billion backlog due to spending cuts. 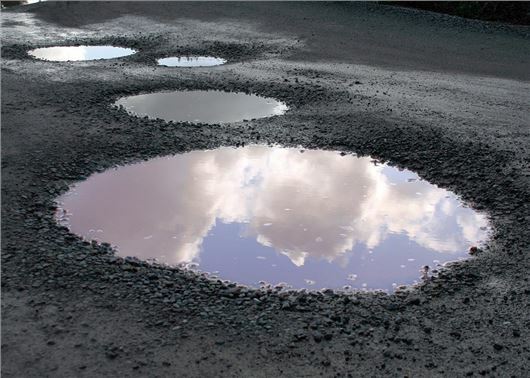 Potholes are usually caused by water getting into the road surface, then freezing and creating gaps in the asphalt. From 2020, VED (road tax) funding will be ring-fenced for improving and maintaining roads for the first time since the 1930s. England’s road network also received a £30 billion boost, as part of the Budget 2018 spending review and almost all of that money will go to improvement of motorways and major A roads. Councils will only get a cash injection of £420 million for fixing potholes on A and B roads. .
A quarter of van drivers who took part in the Mercedes-Benz survey believe that Britain’s roads are in a poor or very poor condition. And it’s not just the terrible condition of the roads that are making their lives a misery, with the overwhelming majority (90 per cent) saying that parking is huge a problem too. More than half of van drivers said parking spaces were too small, while other frustrations included inflexible parking bays and an increasing number of ‘permit holder only’ areas. Poor roads and a lack of van-friendly parking is being linked to drivers' mental health, with over a third (37 per cent) of those surveyed saying they regularly experience stress while at work, with depression (15 per cent) and anxiety (21 per cent).